The author of How to Win at Pac-Man and How to Beat the Top Video Games has bested one of his toughest opponents: the Atlantic City gambling establishment. The New Jersey Supreme Court has ruled Ken Uston (80 Micro, June 1982), a legendary blackjack counter, cannot be barred from gaming tables by the city's casinos. The 5-0 opinion was handed down on an appeal by Resorts International and the Atlantic City Casino Assn. of a lower court decision allowing Uston to play blackjack in New Jersey. However, the high court continued for 90 days an order restraining Uston, the former president of the Pacific Stock Exchange, from playing blackjack. The move will give the state's Casino Control Commission time to act on the issue of counters. Uston's card counting ability helped him earn enough money to retire at age 37. Sony Corporation of America entered the personal microcomputer market with the distribution this month of its Z80A-based SMC-70. Although the basic SMC-70 has an 8-bit microprocessor, Sony curbed criticism of its new machine by offering an optional 16-bit adapter unit upgrading the micro to a system based on Intel's 8086 chip. Priced at $1,475, Sony said its micro is aimed at the business market. The basic SMC-70 contains 64K of RAM expandable to 192K; the 8086 version 128K of RAM expandable to 256K. In ROM, the Sony micro has 32K, which includes memory for Sony Basic, the system's monitor and an automatic start-up diagnostic. The diagnostic automatically runs a failsafe test of the system when it's turned on. Thirty-eight K is dedicated for video memory—6K for characters and 32K for graphics. There are four graphics modes: 160 x 100 dots (16 colors), 320 x 200 (16 colors), 640 x 200 (4 colors), and 640 x 400 (2 colors). Digital Research Inc.'s CP/M operating system has been enhanced by Sony to handle its micro's color graphics capabilities. Three memory storage options are offered for the micro: 3.5-inch floppy disk drive with a capacity of 280K; 6 megabyte hard disk; and 256K cache memory device, which looks like a standard disk drive but operates faster. The basic SMC-70 has 13 input-output interfaces. Among them are a Centronics-type parallel port, RS-232C, RGB video and black-white composite video, light pen, numeric keypad, and cassette interface. Sony will include with the micro Visi-calc, a family of word processors, a data base manager, a six-module accounting system package and several vertical market packages. Nippon Electric Company Information Systems Inc. has introduced a new 16-bit personal computer for the business market. 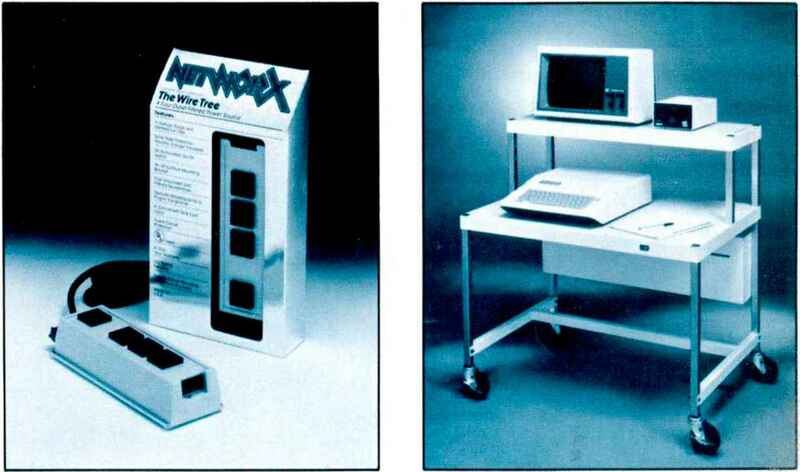 The Advanced Personal Computer has a CP/M-86 operating system and is based on a NEC-manufactured 16-bit 8086-compatible microprocessor. Two versions of the APC are offered by NEC. The monochrome model, priced at $3,298, has a green-black monitor with resolution of 8 x 19 dots. It has 128K of RAM and a dual-sided 8-inch disk drive capable of storing 1 megabyte. The color model, priced at $4,998, includes two disk drives and an eight-color monitor. Otherwise it is the same as its monotone brother. Symbols for the screen display can be chosen from one set of 200 predefined characters or defined on a dot-by-dot basis and stored on disk. The Japanese firm's micro comes with a standard office typewriter keyboard, which includes 22 dual-mode user-definable function keys. Standard input-output features of the machine include a parallel printer controller and serial communications controller, supporting asynchronous and synchronous communications at 19,200 baud per second. Software for the APC includes Microsoft's MSDOS; Ryan-McFarland's RM/COBOL compiler; System Plus's Accounting Plus packages; the Benchmark Word Processor; Metasoft's Telecom-municatorand Mailing List Manager; Chang Laboratories' Microplan; AshtonTate's dBase II Database Manager; and a family of asynchronous and synchronous communications packages from IE Systems. "Our ability to introduce such a com petitively priced product" said Richard M. Underwood, President of NEC Information Systems, "is due to the fact that NEC itself directly manufactures most of the components used in the new computer. This degree of direct control also means we can offer users a level of reliability unsurpassed by current market offerings." Digital Equipment Corporation is gearing up to lock horns with Apple, Tandy, and IBM for a share of the personal computer business market. The Maynard, MA, firm expects to manufacture 100,000 systems this year and start distributing them by the end of November. However, a knowledgeable observer of the computer industry noted DEC'S software and documentation group would have to "burn the midnight oil" to meet that deadline. • The Rainbow 100, priced at $3,495, Including CP/M 80-86. It has two microprocessors—the Z80 and Intel 8088— and 64K RAM, expandable to 256K. Options include graphics capabilities, color CRT, and 5%-inch Winchester disk drive. • The DECmate II, priced at $3,745, including CP/M option card. It runs on the CDS310 or WPS-8 operating systems. It has 96K of RAM and its software is compatible with Digital's word processor, DECmate. Options include a 51/4-inch Winchester and CX and DX communications software. • The Professional Series, consisting of two models: the 325, priced at $3,995, and the 350, priced at $4,995. Both machines run on the P/OS operating system, a derivative of the system used on DEC'S larger PDP-11 computer. Options for both machines include extended graphics, floating point adapter, and Ethernet and DECnet support. Options for the 350 include a 51/4-inch, 5 megabyte, internal Winchester and a color monitor. Digital expects to have 75 software products, including operating systems, ready for its new micros by the end of 1982 or the beginning of 1983.
its Here! ine computer Strategy Came with Bounce! Have you ever seen a fast action game combined with the intense strategy of chess, backgammon or Othello? Ricochet...the first abstract strategy game designed exclusively for the computer owner...is both. And loads of fun! You and your opponent each have six opposing blocks to maneuver and two launchers to fire. Your shots ricochet off the blocks, changing their position with every hit, while earning you points on the way to their targets. The longer your shot ricochets, the more points you get. You don't have to play alone, either. Play against any of four different computer opponents, (each a different personality), or another human. Five game variants to choose from—each requires a different strategy. Ricochet is truly competitive...if you want it to be. A "smart clock" lets you put more pressure on your opponent by forcing him to play faster than you. But you've got to win two out of three (or three out of five) games to claim victory. Your computer rates you after each match, so you can compare your mastery of the game with that of other players. In the long run, you're trying to rack up points for your personal Ricochet Rating. 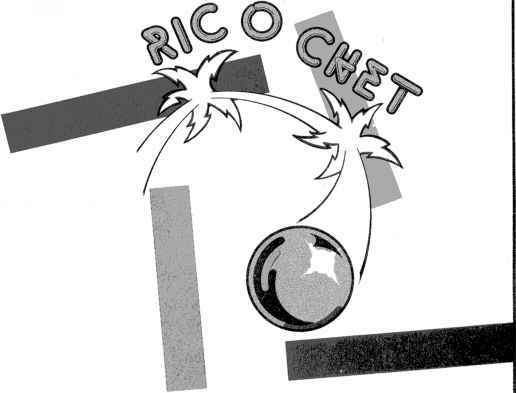 Get Ricochet now at your local dealer for your Atari, Apple or TRS-80. Suggested retail price: $19.95. •apple, atari and trs-80 are trademarks of Apple Computer, inc., Atari, inc. and Tandy Corp.. respectively. P.O. BOX 4247, Mountain View, CA 94040. All Tandon disk drives from Computex are fully tested for Radial Head Alignment, Track 0 Switch, Speed. Instantaneous Speed Variation ISV , Azimuth, then verified for data storage integrity, reliability and systems compatibility.